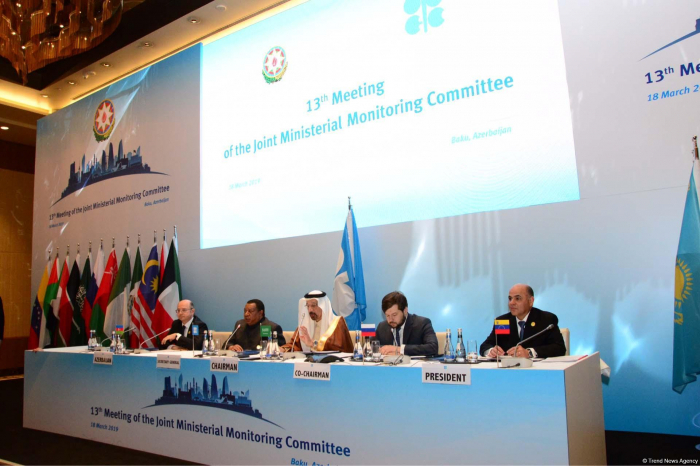 The 13th meeting of the OPEC/non-OPEC Joint Ministerial Monitoring Committee (JMMC) is underway in Baku March 18, AzVision.az reports. The meeting participants are discussing the current state of the oil market, existing problems and other issues. Speaking at the opening of the event, Azerbaijan’s Energy Minister Parviz Shahbazov said that Azerbaijan is ready to further support the efforts of OPEC to maintain balance in the oil market. This event shows the historical role of Azerbaijan in the oil industry, he said. In turn, Deputy Energy Minister of Russia Pavel Sorokin expressed hope that the meeting on March 18 will become another step to achieve better results in the oil market, to provide even better understanding and elimination of uncertainty, and to discuss further steps during the first six months of the agreement’s implementation. Minister of Energy, Industry and Natural Resources of Saudi Arabia Khalid Abdulaziz Al-Falih said that he is happy that this meeting is being held in Baku, the homeland of oil.